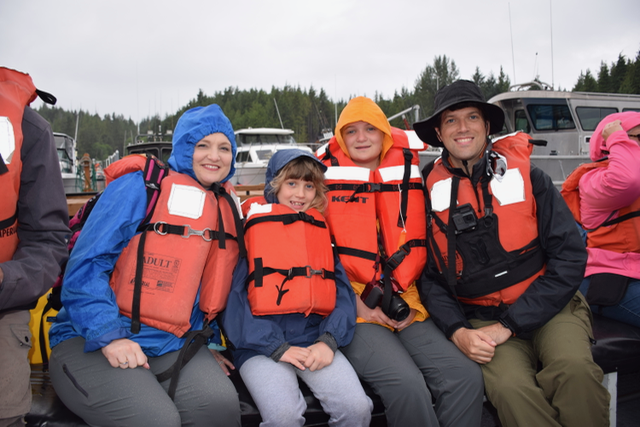 We boarded a coach and did a quick loop through town on our way to the Knudson Cove Marina. Our driver Victor explained that there used to be a large spruce mill in downtown, but it was shut down in 1980 due to increased regulation. The building now houses the Great Alaskan Lumberjack Show even though it is no longer a logging town. He pointed out the new fire station which cost $10 million, which is more than the $7.2 million the U.S. paid for Alaska. He said that many of the gift shops today are housed in buildings that were bars and saloons in the early 1900s. 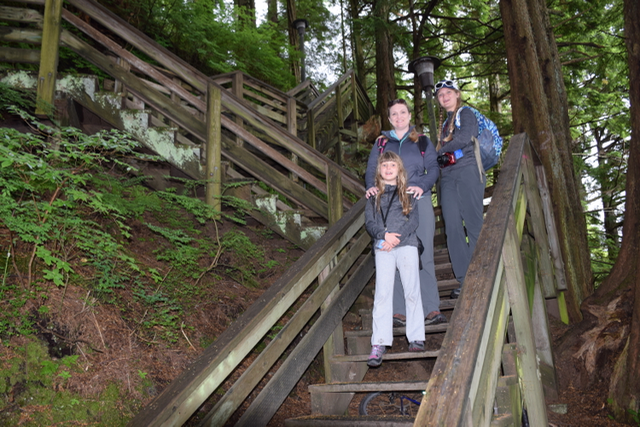 Ketchikan has 24 outdoor staircases that are designated as roads with official street names. The largest of these is Elliott Street with 197 stairs. The town has a tunnel that is in the Guiness Book of World Records. It is the only tunnel you can drive or walk through, drive or walk around, walk over via stairs, and kayak under at low tide. Much of the downtown area is built on a pier, so at low tide you can take a kayak under the city. The city has an ordinance that prohibits any buildings more than three stories. Also, everyone is restricted to a 25 mph speed limit. This includes fire, paramedics, and police. 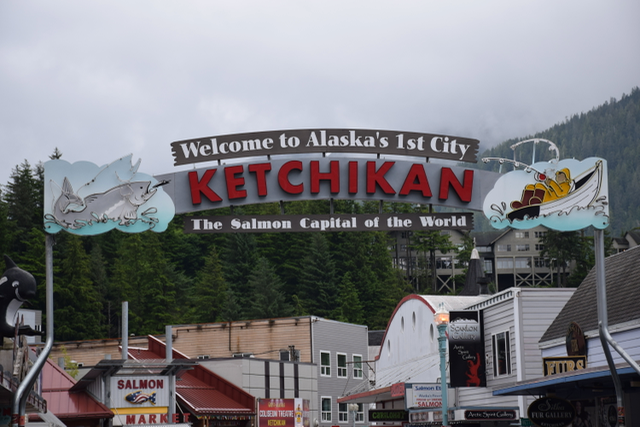 Ketchikan is an island that is not accessible by road, and even the airport is on a different island. The area has two black bears for every resident and averages 13 ft of rain per year. Many residents have to collect rainwater in vats because they don’t have water lines. The islands in the area are all formed out of granite, which makes it hard for trees to take root and they fall over easily. We saw this a lot throughout the day. 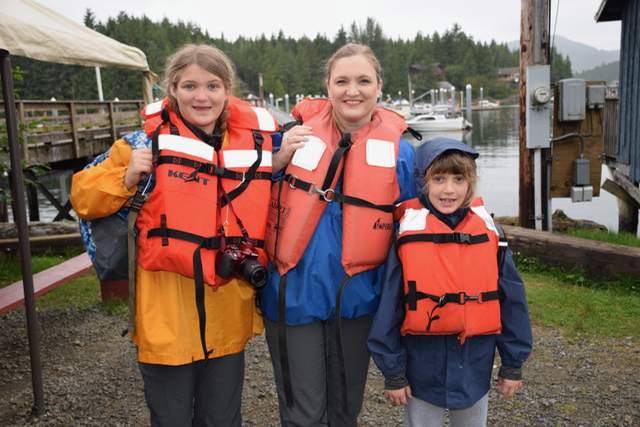 When we arrived at the marina, we were given some super stylish life jackets and then boarded the Seahawk III banana boat. It was a motorized boat with a steel bottom hull and and inflatable sides. Our guide was named Garrett, and he had just graduated high school in Arkansas. The captain was named Bruce. The ride through the Behm Canal was a little rough, but fun, even in a steady rain. The canal is glacier formed and is over 1,000 ft deep. 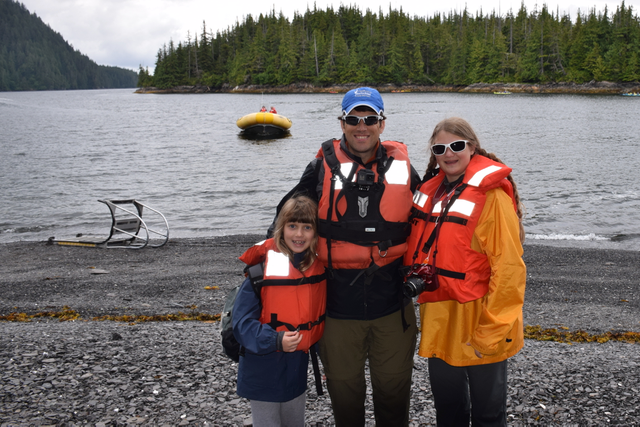 After about 15 minutes we arrived at Betten island, which is part of the Tongass National Rainforest. This rainforest is the second largest in the world behind the Amazon with 17 million acres. In order the qualify as a rainforest an area must get 55 inches of rain in a year. This area gets over 150 inches annually. On the shore we met our guide Carley and then started a nature hike on a boardwalk through the island. The island is one mile wide and three miles long. Early on we saw bull and bladder kelp. The bull kelp looked like a rope and was very strong. It got its name because it looks like a bullwhip. 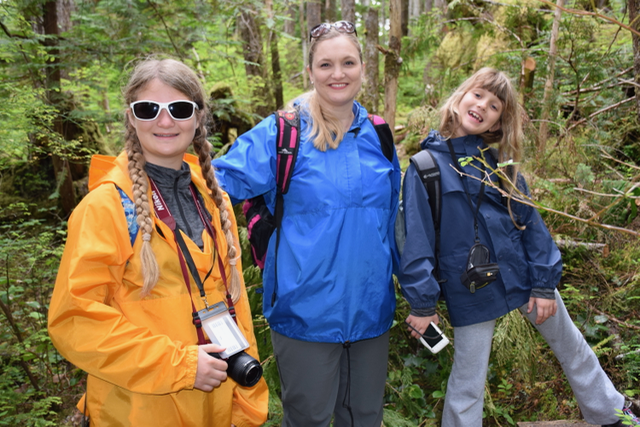 All of the trees on the island are Hemlock, Sitka Spruce, or Red Cedar. 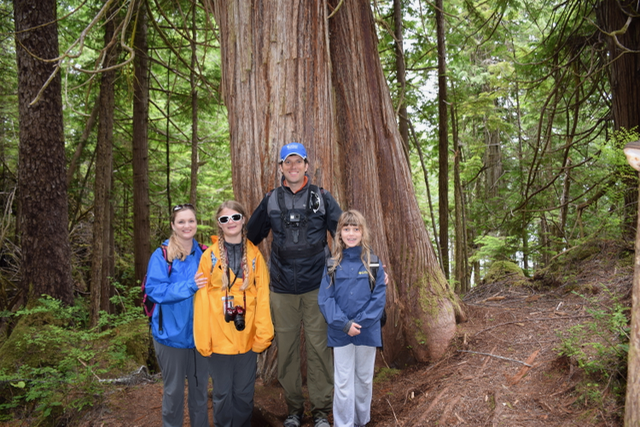 We saw a large Red Cedar that was over 860 years old. The Red Cedar is the type of tree that was used to make totem poles. We learned about “Mother Logs,” which are logs that have fallen over and have other trees and plants growing out of them. It is easier for plants to take root in a log than the granite on the island. 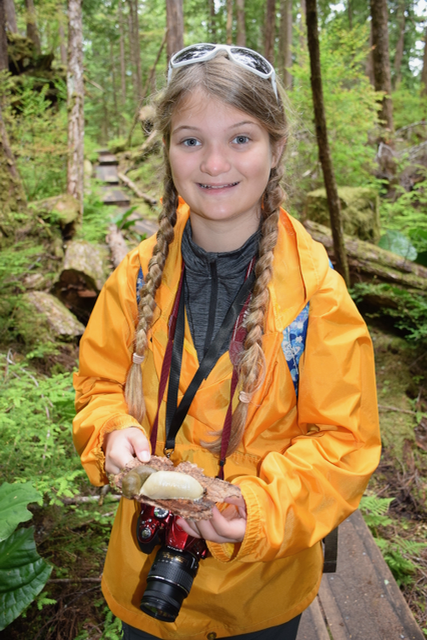 We also saw several Banana Slugs, which were very large. There were two slugs on a piece of park that we were able to pick up. 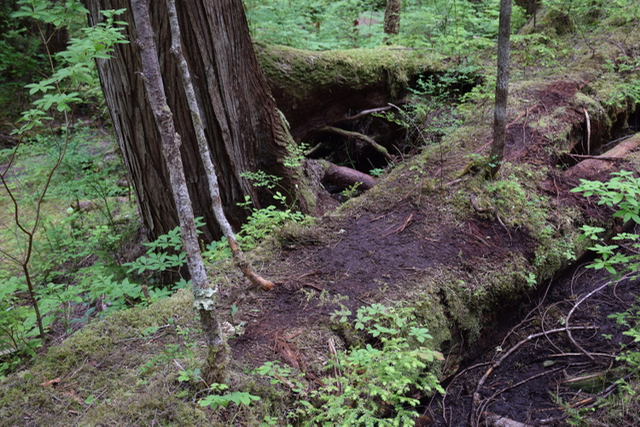 Along the way we saw evidence of past logging activity with buttresses that had been left behind. You could see the hatchet marks in the stumps. The logging industry becan to decline in 1991 when Bill Clinton signed a law that prohibited the building of additional roads in the Tongass National Rainforest. This meant that additional logging roads could not be built and the final pulp mill closed in 1997. This was devastating to the economy of the area until cruise lines made it a port of call in the 2000s. We saw examples of where natives had stripped bark off of one side of trees for use. This was always done on the side away from the ocean. We saw lots of fungus including “Bear’s Bread,” which is eaten by black bears to shut down their digestive system before hibernation. It is rock hard on top and soft of the bottom. It only grows on dead trees. At the bottom of the dead trees was “Old Man’s Beard,” which is a type of moss that only grows in areas where is air is 98% free of impurities. 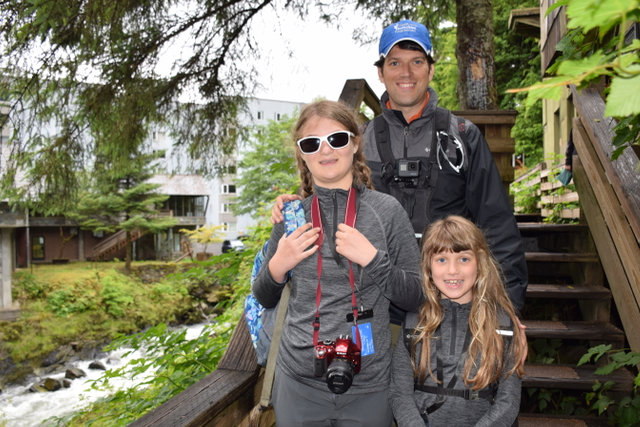 At the end of the hike we enjoyed some hot chocololate, smoked salmon and cheese before getting back on the Seahawk. On the way wack to the marina we saw a U.S. Navy Submarine testing facility. We also saw large slanting rocks on some of the islands that is caused by tektonic upheaval because of the fault line. Lots of plants and trees grow On these rocks. 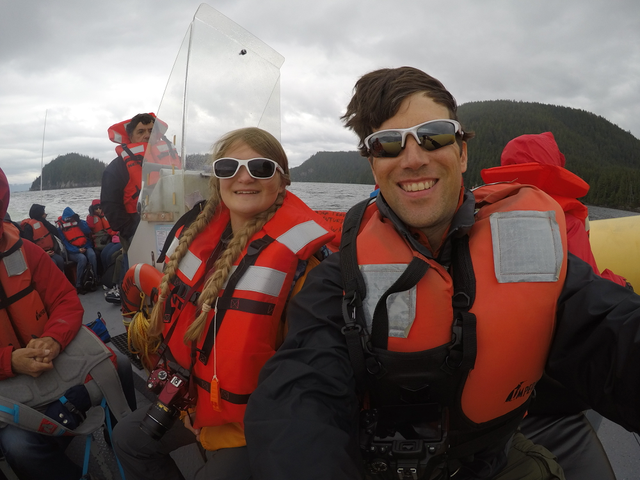 Garrett explained that much of southeast Alaska is comprised of islands that make up the Alexander Archipelago. We did briefly spot mainland Alaska from the Seahawk. 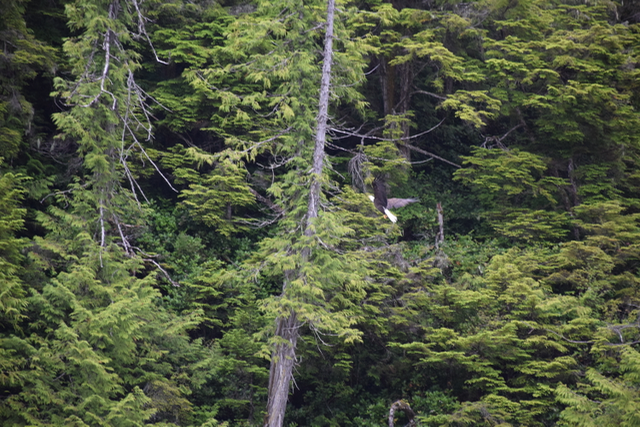 Just before we got back to the marina we saw some bald eagles flying and then saw a nest with babies who were flapping their wings. This is to build strength and get ready for their first flight. Eagles mate for life and come back to the same nest year after year. They can live 20 to 25 years and have a six to seven foot wingspan. After getting off the Seahawk, we got back on our coach back to downtown Ketchikan. On the way, Victor told us a lot about totem poles, which were very prominent in the area. Totem poles never had inanimate objects on the top. Back in town we headed up to Creek Street to do some shopping and the had hot chocolate and baklava at the New York Hotel and Café, which originated in 1925. We also got to climb one of the stairway streets call Married Man’s Trail that overlooked a river for most of the way. 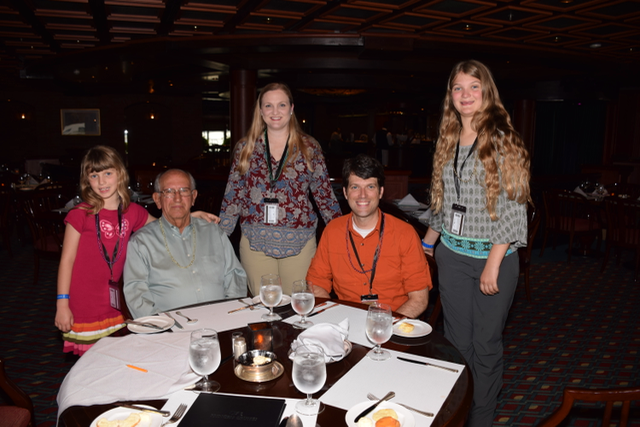 Back on board we met Papa at the Bayou Cafe specialty restaurant, and I got to enjoy a delicious porterhouse steak. We all got beads as we sat down and by the end of dinner about half the people in the restaurant had given theirs to Sara. After dinner we saw a comedian in the Princess Theater while Sara was in kids club. After dinnner we spent about an hour packing and then went to pickup Sara. Before calling it a night we grabbed some ice cream in the Lotus Pool area. 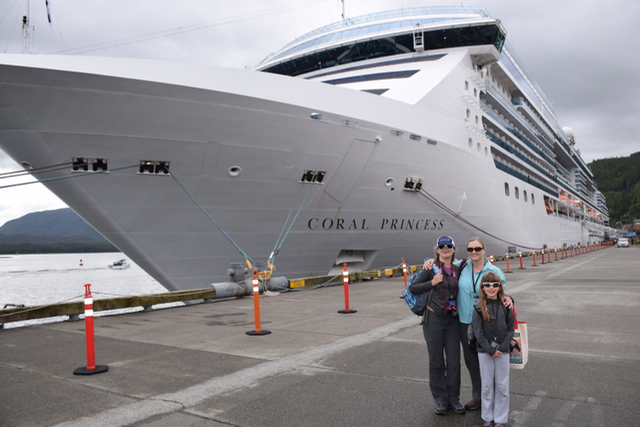 Tomorrow we have a relaxing day at sea, which will be our last day before arriving in Vancouver.